Caught like deer in the headlights Northern Ireland’s examination body, CCEA have had to admit to blunders in the 2011 exam cycle after first denying them. PACE had contacted the Belfast Telegraph about errors in the A-level maths paper after contact from teachers concerned about a mistake in the further maths paper. When the Belfast Telegraph contacted CCEA they denied any problems with their exams but pointed the reporter to an English exam board. 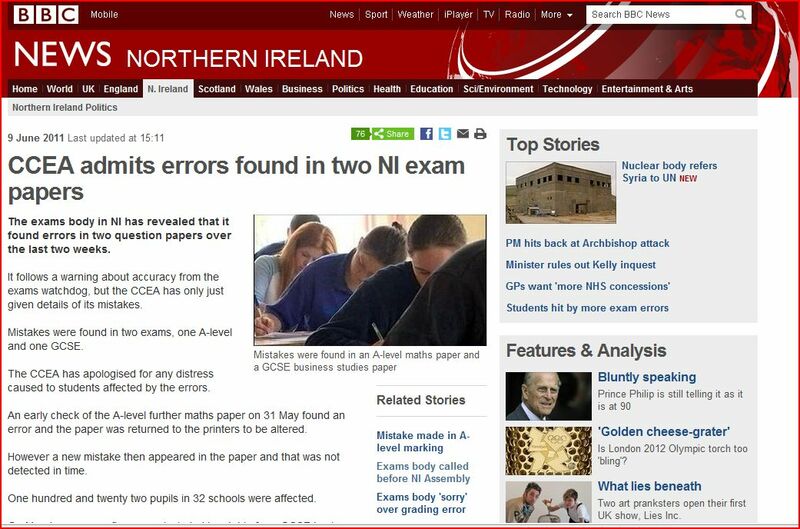 See the BBC story here: http://www.bbc.co.uk/news/uk-northern-ireland-13714383 No doubt the Belfast Telegraph and Ofqual may have more to say on the matter.